There are three chief pairs of salivary glands, which have received the names of parotid, submaxillary, and sublingual, together with several subordinate glands known as the molar, or buccal, labial, lingual, and staphyline. They have a united weight of about 8000 grains avoirdupois, or about l 1/2 lbs. The parotid gland is by far the largest of the three principal pairs, weighing as much as four times the two others put together. The sublinguals are the smallest. The position of the several glands is shown in the adjoining wood-cuts. Fig. 76. - Salivary Glands Exposed. 1 Parotid gland. 2 Molar glands. 3 Sublingual gland. 4 Parotid Duct. 5 Masseter muscle. 6 Facial nerve. 7 Jugular vein. 8 Submaxillary vein. 10 Labial glands. 11 Labial ducts. In external appearance the salivary glands are of yellowish-white colour, and are easily broken up into small granules named lobules. In their structure they present a remote resemblance to a bunch of grapes (fig. 78), and have hence been termed racemose glands, the stalks of the grapes (fig. 79) being represented by the ducts, and the grapes themselves by the follicles or secreting parts. Many such ducts meeting together form the principal salivary duct, which is single in the case of the parotid gland, opening on the inner side of the cheek, whilst in the case of the submaxillary gland it opens on either side of the tongue on the floor of the mouth. The ducts of the sublingual gland are numerous, and discharge their contents into the mouth beneath the tongue. Fig. 77. - Salivary Glands. 1 Submaxillary gland. - - Submaxillary duet (Wharton's duct). 3 Cluster of openings of ducts of sublingual glands. 4 Tongue. 5 Circumvallate papilla. 6 Fungiform papillae. "Jugular vein. 8 Submaxillary vein. Fig. 78. - Section of Salivary Gland, showing a Group of Lobules. 1 Secreting cells lining a lobule. 2 Central space into which the secretion is poured. 3 Dark cells forming the demilunes of Giannuzzi. Fig. 79. - Section of Salivary Gland, showing the Connection of the Lobules with the Ducts and their Resemblance to a Bunch of Grapes. 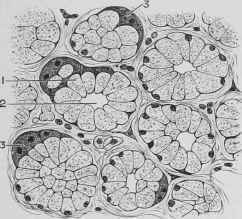 A section of several of the follicles or grape-like bodies is here shown (fig. 78), and it is seen that they are lined with cells which discharge the saliva they secrete into a central passage, whence it passes on into the duct. This small duct and others unite to form larger ducts that discharge their contents into the mouth. The saliva produced by the several glands differs considerably in its character and properties, in some, as in the submaxillary, being thick and slimy, whence that gland is named a mucous gland, whilst in others, as in the parotid, it is thin and watery, and this gland is therefore termed a serous gland. Occasionally, as in the submaxillary gland of man, both kinds of saliva flow from one gland. In all instances the saliva is poured forth in abundance as soon as food is introduced into the mouth; and as it is a typical example of the mode in which secretion is effected under nervous influence, and that on which our present knowledge of that process mainly rests, it may be advantageous to describe in some detail, but with as much simplicity as possible, the events that take place. Let us suppose a (fig. 80) represents the surface of the tongue, with the fungiform, and b circumvallate papillae of taste upon it; c a gland opening upon the surface, L an artery ending in capillaries D surrounding the gland. There are three nerve centres implicated in the secretion of saliva, each composed of many cells, here represented by one cell only. Of these three b9 is the glossopharyngeal, or taste centre; a 5 is the lingual branch of the fifth pair of nerves; 7 is the facial centre, which gives branches to the gland cells and to the artery; lastly, s is the sympathetic nerve, springing from a centre, and supplying the gland cells and artery. When the mouth is empty, and no secretion is taking place, the sympathetic nerve keeps the blood-vessels in a contracted state, and the gland is quiescent. But if sugar, salt, or other sapid substance be placed on the tongue, the nerves in the papillae conduct the impressions they receive in the direction of the arrows to the taste centres 5 and 9. Thence a nervous impulse is transmitted to the motor centre 7, as well as by other fibres to the brain. Fig. 80. - The Nervous Mechanism of Salivary Secretion. 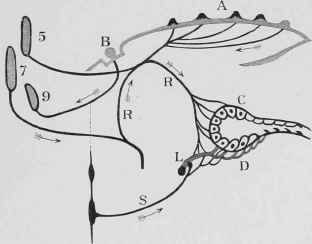 From rr, which is a branch of the facial nerve named the chorda tympani, it will be observed, two sets of fibres emanate, one going directly to the cells of the gland, the other to the artery. Those to the artery cause it to dilate and so allow a freer current of blood to circulate in and around the gland; the other stimulates the gland cells themselves to secrete, and thus leads to an abundant flow of saliva. 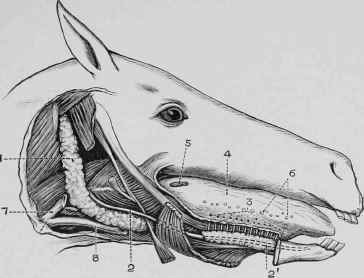 These nervous impulses ceasing with the swallowing of the food, the sympathetic centre resumes its supremacy and contracts the blood-vessels; then secretion ceases, to be resumed once more when sapid substances are again introduced into the mouth. The thorough mingling of the saliva with the food is termed insalivation, and the process is of great importance and is very perfectly accomplished in all herbivora. 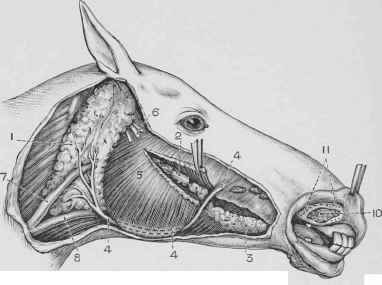 The horse chews its food leisurely, and a large quantity of saliva is poured forth. Observations and experiments have been made which show that this animal takes from an hour to an hour and a half to eat 6 lbs. of hay, and more than half an hour to eat the same weight of oats. It makes about two hundred boluses, or separate masses for swallowing, of the hay; and from forty to ninety boluses of the oats. The weight of the dry hay is increased during mastication from 6 lbs. to no less than 25 lbs., and of the oats from 6 lbs. to 14 lbs., the increase being entirely due to the saliva with which they have become impregnated. The mixed saliva, or saliva resulting from the mixture of the fluid secreted by the several glands, is an opalescent liquid with a specific gravity of about 1005; it is alkaline to test-paper, and contains a special ferment named ptyalin, the properties of which will be discussed when the process of digestion of food is under consideration. Fig. 81. - Abdomen Laid Open. 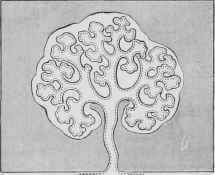 A, Posterior or abdominal aorta. 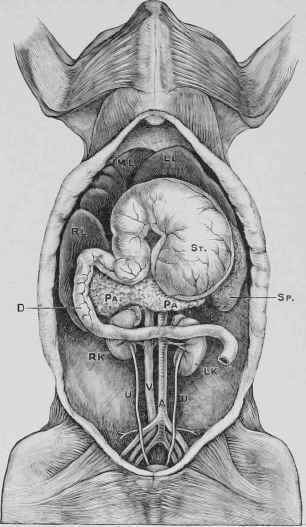 V, Posterior vena cava. U, U, Ureters. R K, Right kidney. L K, Left kidney. D, Duodenum. Pa, Pancreas. Sp, Spleen. St, Stomach. LL, Left lobe of liver. ML, Middle lobe. RL, Right lobe.